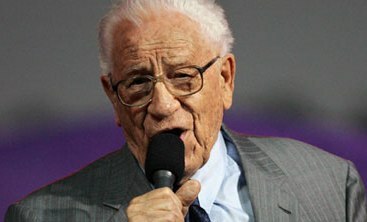 As a kid, I barely took notice when the rich baritone voice of George Beverly Shea boomed through my Grandparents’ living room. But that’s where I first heard him. George died a couple of days ago at the age of 104 after singing for decades all over the world with Billy Graham, his voice likely heard by more people than any gospel singer in history. I’m guessing his passing will go without notice for most folk my age and especially those younger. He was an icon of a generation gone by, a fixture for folk of another era. My folks would still enjoy listening to him sing “The Wonder of it All” or “How Great Thou Art.” But they’re octogenarians, and young guns on the leading and bleeding edge of Christian music and ministry today would consider Shea’s stuff not only outdated, but wonder how it was ever such a big deal. But he was a big deal. He was a well-known gospel soloist when he met Billy Graham in the early 1940s. He joined Graham’s traveling crusade team in 1947 and stayed with it until Billy’s health forced him to call it quits nearly 60 years later. Here’s a guy who sang live before at least 200 million people and recorded more than 70 albums. He was nominated for 10 Grammys and received countless awards and achievements in music and ministry. So despite the fact that most hipster worship dudes with v-necks and skinny jeans and their equally cool pastor-counterparts with soul patches today have either never heard of him or would consider the whole traveling crusade thing passé at best and atrocious at worst, I think there is much to be admired – and learned – from GBS and Billy. They were innovative. They took a fresh, creative idea and used it to present the gospel. Yes, there was organ music and by today’s norms Shea’s singing makes the Gaithers look like Kiss by comparison. But this was cutting edge, novel ministry. Renting a huge hall, inviting people to come to a megachurch experience to hear an extremely popular and gifted singer — for free – all as a way to deliver the unadorned gospel message as only Billy Graham could deliver – well, it was genius. They were ahead of their time. In a simple, dignified, uncool way. The best ones always are. They were a team. Billy preached, George sang. Each had their gifts. They set each other up so the other could penetrate the heart. Each loved what they did. And they did it well together. They were friends. They stuck together for over six decades. Can you name another ministry pair like that? These guys loved each other. Respected each other. You can go through all kinds of tough stuff if the people on your team are also your best friends. They stayed humble. Billy described George as one of the most humble, gracious men he ever knew. George said the same of Billy. The masses didn’t lead to limos and lights, the popularity didn’t change them at all. They welcomed it as increased opportunity to preach the good news of Jesus, which they did boldly but humbly. When George was in high school, he was off track with the Lord and his Godly mother was worried about him. She found a poem by Rhea Miller, written a few years before, called “I’d Rather Have Jesus” – and put a copy of it on the piano, knowing he would see it there, hoping it would change the course of his life. The words spoke to George and moved him so deeply that he felt it was the Lord himself inviting him home. To make Jesus the most important thing in his life. He sat down at the piano and began singing them like a declaration of faith, with a tune that seemed to fit the word. Shea’s mom heard him singing, and asked him to sing it in church the next day – and George’s life direction changed radically. Instead of a lucrative music career with NBC he took off with Billy and the Crusade. And he sang that song all over the world. Not because it reminds me of George or Billy, or my grandparents, or because I’m just a sentimental sap. I love it because of the simplicity and power of it. And because every time I hear it I feel like it calls me home, too, like it did George. Here is George singing it in 1983. [youtube]http://www.youtube.com/watch?v=eL2iK1eYVd8[/youtube]No headset mike. No drums and guitar. No words on the screen. No hand waving or foot-stomping. Just the simple statement that Jesus is enough. Check out the lyrics. Here — let me put them on the piano for you, so you can just happen to sit and read them now. See if Jesus doesn’t use them to call you home, too – to invite you to make him the most important thing in your life. I happy to inform you that I had been reading your web-side I am so much interested to know more about the statement of your church. Thank you so much for being a faithful reader of my blog. You can visit our website at http://www.mountaincc.org or call our office at 410-877-1824. Please let me know if you have any other questions. I am happy to inform you that I had been reading your web-side and I am so much interested to know more about the statement of your church.